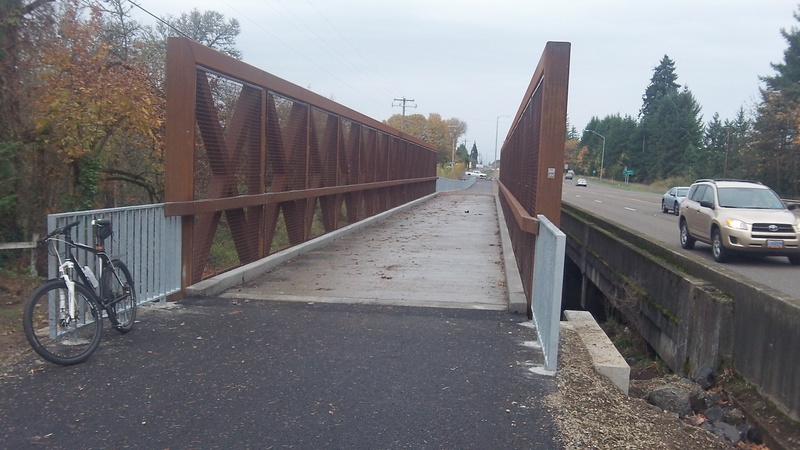 Finally, the Highway 34 bikeway in Linn County is finished and open to traffic. It allows cyclists to make a convenient and relatively safe round trip from Albany to Corvallis, though when I tried it out Thursday afternoon, mine was the only bike I saw all along the roughly 25 miles of the route. I picked up my bike in West Albany, headed down Riverside Drive, sailed along the new bikeway, admired the Owl Creek bridge, passed a deer carcass in the verge between path and highway, and followed the path as it ducked under two Willamette River bridges and then led into Corvallis on the wooden sidewalk of the Van Buren Street bridge. Then I jogged over one block to Second Street, turned right and let the quartering tailwind from the southwest — along with the draft created by steady highway traffic — push me back to Albany on Highway 20. It’s hard to imagine a smoother ride. Looking east: The bridge across Owl creek alongside Highway 34.